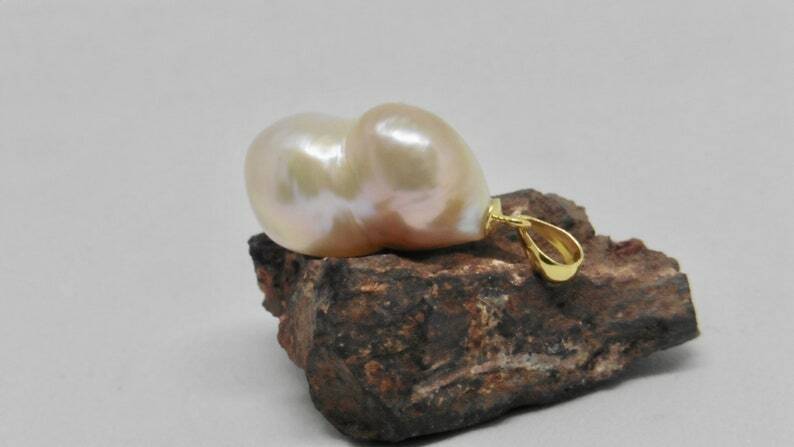 A pearl pendant made of a single very large baroque pearl with a gold-plated hook for threading, e.g. for a silk ribbon. This pendant also looks enchanting on a delicate gold chain. It is a real Ming or Edison pearl. 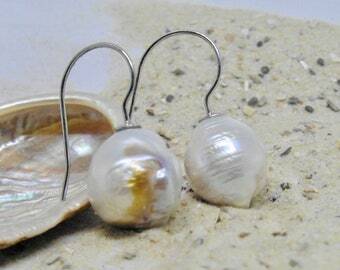 With the purchase you receive exactly this pearl. It was specially drilled as a pendant only from above. The Edison pearls are a new original pearl variety with core, from a new Chinese mussel breeding originated, with very special shine and a surface with depth effect, it looks sometimes a little bit like folded, very natural with a metallic looking surface. This pendant will be delivered without chain. You can choose between 4 variations: without suspension, with gold-coloured jewellery wire, with silk ribbon or with a very fine genuine 750 gold Omega tyre, 1.2 mm in diameter and 40 cm long, with yellow gold on one side and white gold on the other. This frost is very sensitive and very valuable. It is thoroughly checked for intactness before shipment and cannot be returned in any case. To the omega ring: it is from 18 carat / 750 gold, to be carried on both sides with white gold & yellow gold, chain 40 cm long, 1.2 mm wide, weight 4 g, this corresponds purely in the gold price at present 111 € (1 g 750 gold at present 27.80 €). The pearl on the silk ribbon is an example and does not correspond to the pearl shown here. Size of the pearl: approx. 11.3 x 19.4 mm.